What’s the deal with Downer Woods? The University of Wisconsin-Milwaukee isn’t known as an urban campus for nothing. Plopped squarely in the middle of a dense residential district, it’s a school forever wanting for space, often choosing to expand either off campus or simply up. 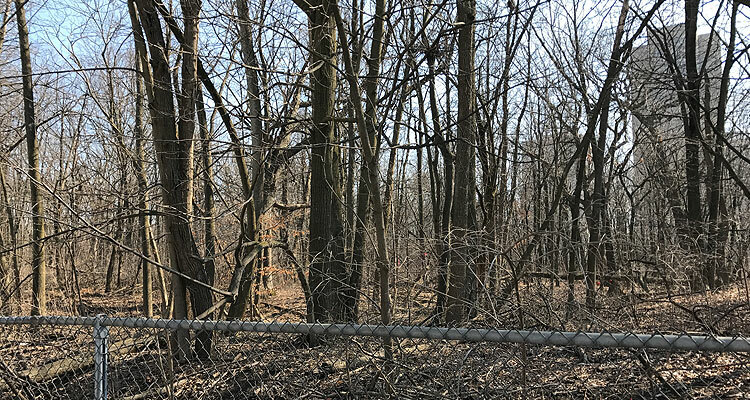 But on the far north end of campus, behind the four Sandburg Residence Halls and a stone’s throw from Shorewood, stands an entirely incongruous and puzzling school (and neighborhood) amenity: an 11.1-acre, fenced-in forest known as Downer Woods. What’s the deal with that? First, some boundaries. 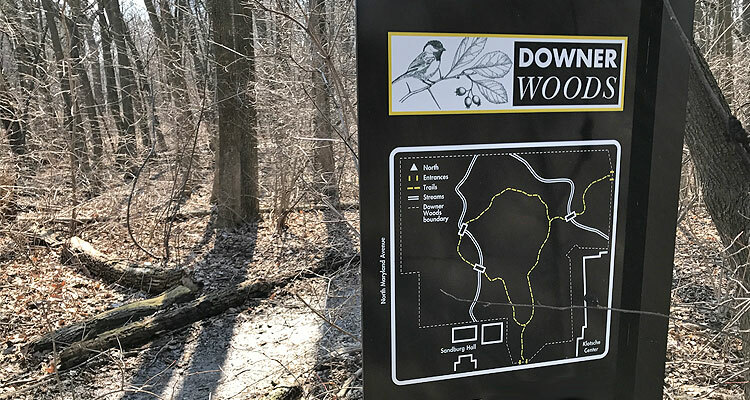 The entire Downer Woods area clocks in at 21.4 acres, and includes the forest, more nearby green space, and historic buildings that were once part of Downer College (now owned by UWM). N. Maryland, E. Edgewood, and N. Downer avenues surround the area on three sides; the forest, meanwhile, borders N. Maryland and E. Edgewood. Prior to 1998, the woods was not managed as a natural area, and the vegetation bore little resemblance to that of the mature beech-maple forest which must have once occupied the site. Perhaps the most immediately apparent feature of the plant community when the Field Station assumed responsibility for its management was a dense shrub layer of non-native buckthorn and honeysuckle. After the Field Station began managing the site, we started controlling exotic species, constructed a formal trail system, established a permanent grid system and sampled the vegetation of the forest. The plant species list and vegetation data are available on request. 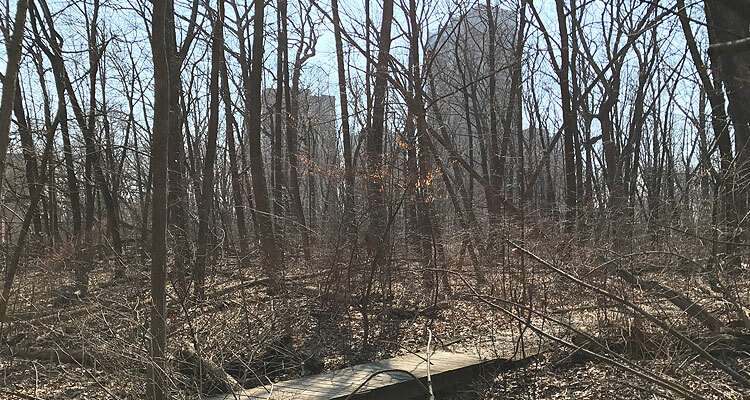 Now that the thicket of non-native shrubs has been removed and adequate trails are provided, Downer Woods is being used extensively by neighbors and students for enjoyment of the natural area. The Field Station uses the woods as an outdoor classroom and research site, and the nearby UWM Children’s Learning Center often lets giddy toddlers stomp around in its underbrush. But Downer Woods’ availability to the public truly makes it a hidden gem, oft-overlooked by students and neighbors alike. Enter a gate on the woods’ northeast corner (near the Klotsche Center) and you’ll find yourself on a rough path that loops through its interior. A small stream also loops through the woods, and three bridges cross it at various points. It’s a short, pleasant walk, highlighted by nothing in particular. What’s there to do in Downer Woods? Not much! It’s a forest, after all, and the best thing about forests is that they’re completely bereft of distraction. 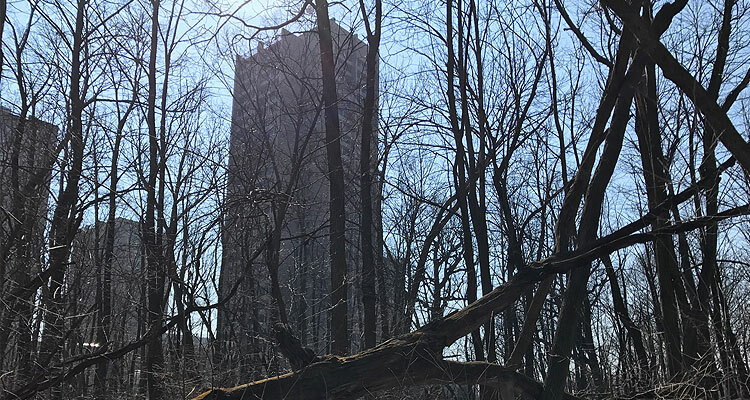 It’s easy to forget that you’re in the middle of both a city and a large urban university, even with the (admittedly sweet) view of the nearby Sandburg towers. 1. Provisions requiring the UW-Milwaukee Chancellor to prepare and implement a Downer Woods natural area management and restoration plan to ensure that the area of the Downer Woods designated as the conservation area is managed properly as a natural area. 2. Provisions requiring that the portion of the Downer Woods designated as permanently reserved woodlands be set aside exclusively for the purposes of community enhancement and relaxation. 3. 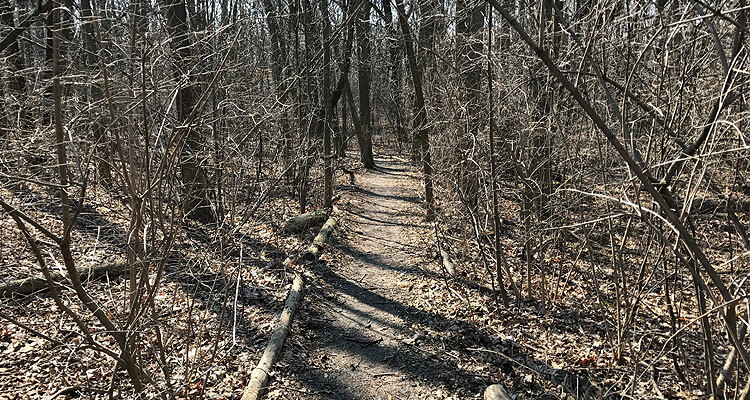 Provisions permitting the portions of the Downer Woods designated as park and woodland areas to be used by UW-Milwaukee as recreational and aesthetic corridors. 4. Provisions specifying that the buildings of the former Downer college be preserved and may not be razed without prior approval of the Building Commission. Which seems to be the final word on the matter. Indeed, according to Field Station Director Dr. James Reinartz, the status of Downer Woods remains unchanged.